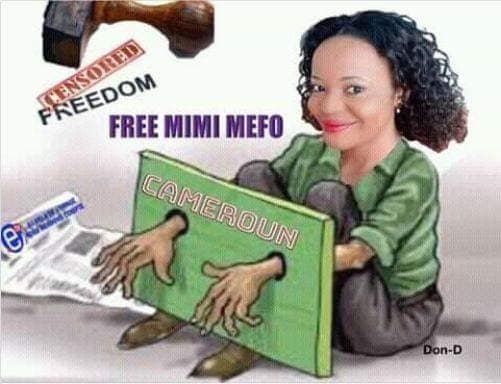 One of Cameroon’s most talented, courageous, outspoken, professional and award-winning journalists, Mimi Mefo Takombo, is spending a third day Friday in the stinking, mosquito-infested and overcrowded New Bell Prison in Douala, that country’s economic capital. Her lead lawyer, Barrister Alice Nkom, says she witnessed Mimi Mefo being led to prison in handcuffs Wednesday night. She held back tears, Nkom confessed, trying to be strong for her client. Nkom says she feels proud to know that Mimi Mefo stands tall, brave, undaunted and unshaken. Mimi Mefo’s willingness to accept the many risks that come with the job and her bold reporting on the genocidal violence unfolding in Ambazonia made her an irritant to the regime which has, certainly been baiting her for a while. She spoke proudly of working for Equinoxe TV, her employer in Douala, but it is her online presence, her ability to dig deep into stories and question sources and those in authority that has endeared her to millions. It is not an exaggeration to say she has become one of Cameroon’s fastest rising journalism star. Prison only grows that stardom. Issa Tchiroma Bakary, Cameroon’s Minister of Communications (please, read Minister of Propaganda), issued a statement Thursday outlining the laughable charges on which she is being court marshalled. They include fake news, dissemination of lies, cyber criminality, terrorism, threats to national cohesion, insults and incitement to revolt. All of them are trumped up! Which is why Mimi Mefo’s fans, televiewers, supporters, friends, and colleagues around the globe have responded to her remanded in custody with a global campaign, demanding her immediate and unconditional release. Join the campaign on Twitter by using #FreeMimiMefo. In the hope of strengthening the lame case the regime is making, Tchiroma’s statement reads like a series of backflips. The goal? Convert regime propaganda and lies into evidence. For example, Tchiroma wants the world to believe that “a group of terrorists broke into” [SIC] the Tubah SubDivision “with the aim to attack the university area and the Tubah Territorial Brigade”. Not true, of course. First, Tubah cannot be “broken into”. Not any more than Mfoundi can be broken into. Second, no terrorists operate in Tubah, except the reference is to Biya forces, of course. Thirdly, the claim that “the aim” of the so-called terrorists was “to attack the university area” is – what else? – fake news, gossip, rumor mongering and hearsay peddling. It is speculation at worst; propaganda at best. The one “valid” accusation the regime could have brought against Mimi Mefo is to fault her for not using the right lingo. On her Facebook post, cited by Tchiroma as the incriminating article, Mimi Mefo stated: “the American missionary was killed by soldiers”. Tchiroma adds “salt and maggie” by stating “…killed by the Cameroonian Army”. The euphemism duly censored and approved by the regime’s propaganda apparatus would have had the accusation read: “the missionary was liquidated by soldiers”. The regime “never kills”, as Tchiroma has told Equinoxe TV time without number. It did not even acknowledge the “liquidation” of a visiting Ghanaian missionary in Batibo earlier this year. Ghana does not frighten to the same extent as the United States if you ask me. When the killer squad took down Rev. Fr. Sop in Muyuka, it was the fault of “a stray bullet”. To “liquidate”, not to “kill” that is just a “nicer” word! To prevent evidence of “killings” being collected, senior regime officials like the Delegate General for the Gendarmerie, have instructed soldiers to stop filming. In other words, stop documenting our operations involving “killings” – beg your pardon! – “liquidations”! If the regime needs a report fixed, Tchiroma cites one in his statement. It is a police investigation conducted “by the Judicial Police Officers from the North West Gendarmerie Legion”. The confusing reference to police and gendarmerie is intentional! You are not to know who handled because neither the judicial police nor the gendarmerie is qualified to ascertain the cause of death. Instead of admitting that incompetence, they are now court marshalling a reporter on charges that she did not cite the findings of an autopsy the regime never shared with the press, even as it irresponsibly shared numerous pictures of the victim’s mortal remains. Charges against Mimi Mefo appear more ridiculous when you consider the exact wordings of her incriminated Facebook post. “A missionary has died today after he was shot by solders”, Mimi Mefo wrote. Help me out, anyone! Where does it say “killed by the Cameroonian Army”? Mimi Mefo did her job. Short of wanting to be a historian of these events, Mimi Mefo met the demands of her profession: to report information promptly and accurately. She reported the death of a missionary that day. That is a fact. So, it cannot also be fake news. The victim was, indeed, “shot by soldiers”. Mimi Mefo did not say if the soldiers were Ambazonian or Cameroonian, but it would seem someone is feeling not only directly accused but also guilty. While Mimi Mefo’s profession required same time reporting – it could have even been “same time” reporting if she was going “live” TV or radio – the regime took many days and benefited from an autopsy to come up with what Tchiroma’s statement calls “reality”, “facts” and “manifest truths”. What Mimi Mefo reported remains the truth until a credible autopsy becomes available. The world was once flat – a fact at the time – until the truth emerged that it is round. If Tchiroma was, indeed, interested in journalists reporting accurately – his job in the regime – he would have shared the “reality”, “facts” and “manifest truths” with them, instead of prowling around, baiting journalists to persecute. Also, and even if the regime provided such information, journalists are under no obligation to accept such as gospel. Notably from a regime that lied about six children “stampeded” to death when they were “liquidated”. Journalists cannot trust a regime that invents tales of Malian soldiers executing women and children in the Far North. It is ridiculous to accuse Mimi Mefo of bringing Cameroonian “Defence Forces into disrepute” or of reporting described as “highly detrimental to the morale of the troops”. It is neither Mimi Mefo’s job to uphold the reputation of the defense forces nor is it her job to boost the morale of the troops. Which is why it remains to be proven that the shots that killed Rev. Charles Truman Wesco were “from a 12-gauge weapon” not fired by a Cameroonian soldier. The claim that the shots came from the right side of the vehicle “position occupied by the terrorists at the time of the incident” is as true as describing the massacres in Ambazonia as a “loyal and legal fight”. War crimes are what they are. We now know that Yaounde would much rather commit genocide, throw a hundred Mimi Mefos in jail, than hurt another American citizen. Who said the fear of America is the beginning of wisdom? Tchiroma? Let him stop spinning the yarn that Mimi Mefo “benefits from the presumption of innocence”. Lair! Lair! Pants on fire! Particularly those males in LRC that have been castrated, domesticated, effeminize, … are scared to death of intelligent women. They like only the ones that run behind sardine, bread, and condoms. Chronically mentally sick group of men among us. Barbaric creatures. Exactly mimi Said the Truth in the mist of dangerous and satanic liers like chiroama making belle politics.